The Republican Party may not have anyone running under its banner for Legislature in the 48th District this year, but that doesn’t mean the party is bereft of candidates to support. As reports filed with the Public Disclosure Commission show, the party apparatus is heavily invested in supporting the comeback bid of Rodney Tom, who claims to be a Democrat, but who Democrats say is really a Republican. Tom, for readers who don’t know, is a perennial party switcher who started out his political career as a Republican, left for the Democratic Party in 2006, and rejoined his old party six years later as part of a backroom deal in which he was installed as Majority Leader in return for delivering the State Senate into Republican hands. Before defecting back to the Republicans in 2012, Tom had won two competitive elections to the Washington State Senate as a Democrat with Democratic support. After delivering the Senate into Republican hands, the Democratic Party disavowed Tom, and he began making preparations to seek reelection to a third consecutive term in 2014 with Republican help — despite still claiming to be a Democrat. But a few weeks after the end of the 2014 session, Tom abruptly ended his reelection campaign, saying his first priority had to be to look after his father. Tom remained involved in state politics as a right wing political operative, but did not reenter the electoral arena as a candidate until this spring, when he let it be known he would be running for the position he previously held. When the Republicans found out that Tom was interested in trying to win back his old job and take out Democratic Senator Patty Kuderer, their operatives began making plans to intervene in the race on his behalf. First, they worked to clear a path for Tom by making sure that he wouldn’t have any Republican opposition (very important because Tom’s planned path to victory over Kuderer requires the support of Republican voters). In this, they succeeded. You can see from looking at the candidate filings that Tom and Kuderer originally had two Republican opponents: Ken Seal and Richard Bennett. 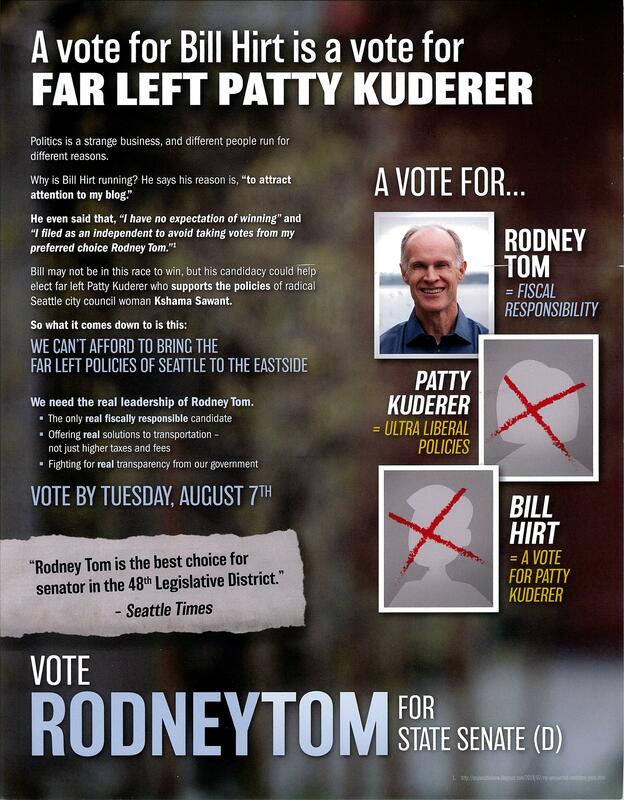 However, both of them withdrew their candidacies on May 21st, leaving just Tom and Kuderer and a third candidate named Bill Hirt. Hirt (who by his own admission perennially runs for office merely to have a platform to denounce Sound Transit’s Link light rail project) was determined to stay in the race. He was, however, amenable to identifying as an independent in order to minimize the possibility of causing interference to Tom’s candidacy. You wouldn’t know it from looking at their public list of endorsements — his name has been omitted — but sources tell us that Tom was indeed endorsed. NPI reached out repeatedly to the Mainstream Republicans to confirm this information, but we received no response. 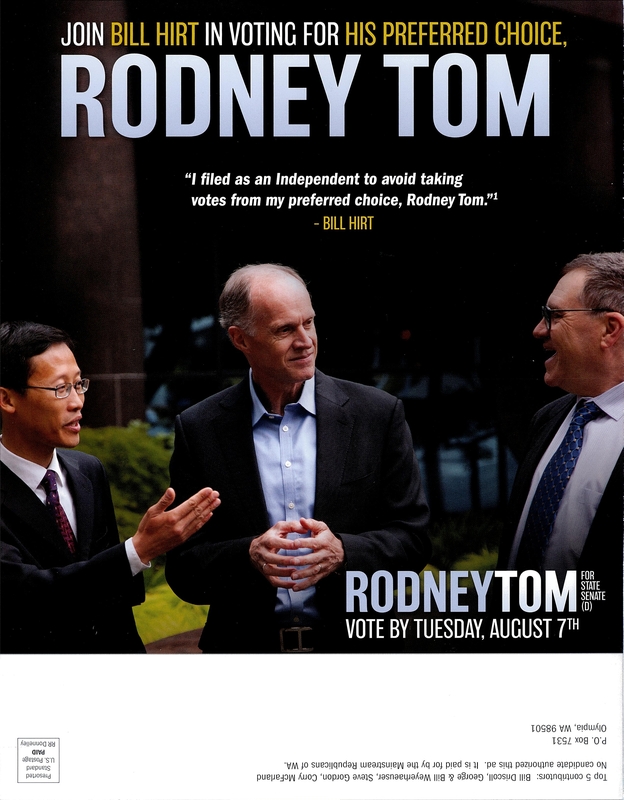 This is the most overt effort we’ve seen yet to recruit Republican voters to support Rodney Tom so that he’ll perform better in the August Top Two election. Tom had previously benefited from independent expenditures in support of his candidacy from another PAC that usually intervenes on behalf of Republicans. Now, he’s getting help from an arm of the party that has “Republican” in its name. Very interesting. It’s like pulling the curtain on the Wizard Of Oz.